Write a C program to read elements in a matrix and check whether matrix is an Identity matrix or not. C program for finding Identity matrix. Logic to check identity matrix in C programming. Identity matrix is a special square matrix whose main diagonal elements is equal to 1 and other elements are 0. Identity matrix is also known as unit matrix. 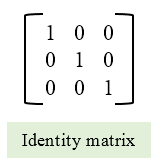 The given matrix is an Identity Matrix. C program to check Symmetric matrix.